This day I want to remind you of the love I have in My heart for you. I loved you before you came into this world. It was My love for you that moved Me to lay down My life so you could have eternal life. It’s My love for you that moves Me each day to reach out to you and pour blessings upon your life so you may have life more abundantly. It’s this same love for you that causes Me to question why you come to Me for help, but then don’t believe in your heart that I will answer. Just because I don’t answer on your time, doesn’t mean it’s not yours. You see there are times My love for you will come with strong and clear directions to help you understand why the blessing is delayed; then supply the strength you need to hold on. My love for you comes with patience, and I want your love for Me to have the same; because patience will help you wait for the fulfillment of your blessing. Oh, My child, My heart is filled with so much love for you, and I will never forsake you. Just come into the comfort of My presence and spend some time listening to Me this day, and all will be made clear. I am right here. I’ve never left you, nor forsaken you. My love for you will never change no matter what you do. This day, lay down striving; lay down your fears and enter into My presence with gladness. Think about Me this day. Embrace My love and embrace who I am. I am your Heavenly Father, and you will never be able to comprehend how much I love you. Therefore, just know that I love you with an everlasting love and love Me in return. I love you. Jer. 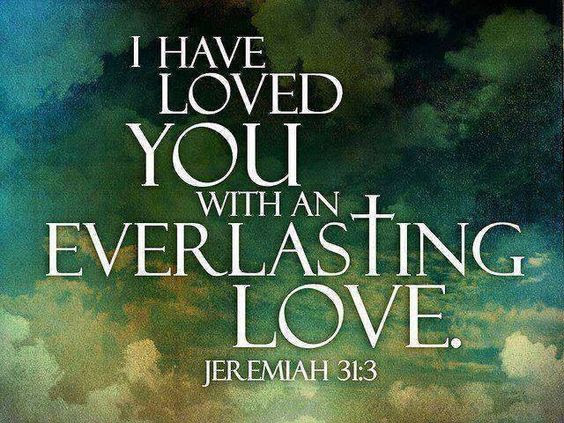 31:3 The LORD hath appeared of old unto me, saying, Yea, I have loved thee with an everlasting love: therefore, with lovingkindness have I drawn thee. John 3:16 For God so loved the world, that he gave his only-begotten Son, that whosoever believeth in him should not perish, but have everlasting life. Rom. 8:38-39 For I am persuaded, that neither death, nor life, nor angels, nor principalities, nor powers, nor things present, nor things to come, Nor height, nor depth, nor any other creature, shall be able to separate us from the love of God, which is in Christ Jesus our Lord.